Stonehenge in England is a prehistoric site of megaliths arranged in concentric circles and horseshoe patterns. Some of the large stones were brought from a mountain quarry 30 kilometers (18 miles) away using crude ancient means. Stonehenge is shrouded in mystery, which is part of its appeal to tourists and sleuthing archaeologists. Latest scientific estimates say it was erected in stages between 3000 BC and 1500 BC. The best speculation is it was an astronomical calendar (a headstone is oriented toward the summer solstice). 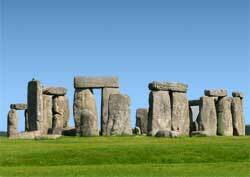 Another sound theory is Stonehenge was used for religious ceremonies. No one will probably ever know for certain. The once popular theory that the Druids (Celtic priesthood) erected it was shot down when modern science proved that Stonehenge was constructed at least a thousand years before their time. Just 17 of the site's estimated 80 original megaliths stand.